Apple saw its worldwide PC marketshare climb to 6.3 percent in the third quarter of 2014, launching it into the top five worldwide vendors, according to new data released from IDC. While Apple has long held a position as one of the top PC vendors in the U.S., it has not made it into the list of top five worldwide vendors in quite some time. With nearly 5 million shipments during the quarter compared to 4.5 million in the year ago quarter, Apple saw overall growth of 8.9 percent year over year, allowing it to edge out ASUS as the number five vendor. Lenovo, HP, Dell, and Acer, meanwhile, held their top four positions. Lenovo, as usual, was the top worldwide PC vendor, with more than 15 million shipments and 20 percent marketshare. Apple moved into the number 5 position on a worldwide basis, slightly overtaking ASUS. The company's steady growth, along with recent price cuts and improved demand in mature markets, has helped it to consistently outgrow the market. As for U.S. shipments, Apple retained its number three vendor position with more than 2.2 million shipments and 13 percent marketshare, up 9.3 percent year over year. HP and Dell held their positions as the top two vendors in the U.S., with 27.7 and 24 percent marketshare, respectively. Overall, worldwide PC shipments totaled 78.5 million units and saw a year over year decline of -1.7 percent, while PC shipments in the United States totaled 17.4 million units and saw a 4.3 percent year over year growth. Gartner has also released its shipment estimates for the third quarter of 2014, but its numbers rank ASUS as the number five worldwide PC vendor with 5.7 million shipments. On the U.S. front, Gartner's estimates also place Apple as the third U.S. vendor with 2.4 million shipments and 14.3 percent marketshare. It is important to note, as always, that the global and U.S. PC shipment estimates from both IDC and Gartner are based on preliminary data, which explains the discrepancies between the two separate shipment estimates. Apple's move into the number five worldwide vendor comes as the company prepares to launch new iMacs and possibly other Mac upgrades at an event on October 16. Apple has also launched minor updates to its Retina MacBook Pro, MacBook Air, and iMac lineup throughout 2014, and has introduced price drops on the two latter products. ipad is a toy compared to productivity and entertainment PC. And yet you managed to not answer the OP question. Thanks for sharing though. Does this include iPad shipments as 'PCs'? 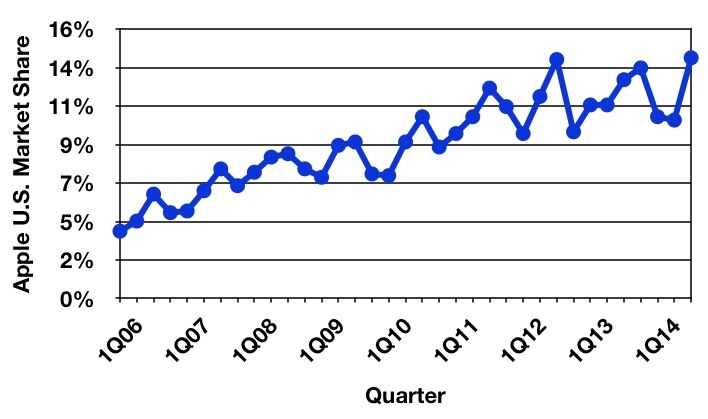 Since iPads are not PCs, and since furthermore iPad sales are much higher than 10 million per quarter, no. iOS7 and now iOS8 must be the painful sour comedown then. I think it would be a lot more - maybe even 15-20%. Keep in mind that Apple controls a much larger share of the high end market. The average PC sale is for a system that costs like $200-400 - Mac Minis (which I'd be willing to bet are their least popular systems) cost like twice that, and they only go up from there. Not a chance of going over 10%. Macs are still a niche market of high-end computers that cannot compare to the number of PC spread literally everywhere. Apple has never acted in the least like it wants to take on mainstream computer sales. Not only does that involve low-cost units that Apple isn't interested in it would also mean keeping operating systems up and current for many years as required by businesses. That directly conflicts with Apple's yearly OS fashion show. Consider that one could have purchased Windows 7 back when the EOL'd Snow Leopard was alive and that there are still five more years to go before W7 dies. At Apple's current pace even Yosemite may be gone while W7 is still supported. I don't think top-notch quality and performance is what the globe is looking to do for everyday computing. Windows based cpu's are still the economical avenue for the mass of the globe. I don't think top-notch quality and performance is what the globe is looking to do for everyday computing. Economical if they have money to burn--or no choice. Macs cost less in the long run: they last longer (so you buy fewer), stay fast and stable longer, have lower support costs, and great resale value. These are concrete, measurable facts, and they save you big bucks. Add up the TCO of Macs and Windows PCs, and you'll find you can get nicely-spec'd Macs for cheaper than low-end PCs that will bog down next year. Props to Cook for helping to make this happen. The surge in sales is likely helped by his moves to offer more reasonably priced Macs. It may only be $100 off certain models, and a lower end iMac, but that's all it takes for a lot of people who want to try a Mac. Often these are people who love their iPhone and want to check out Apple's other products, but don't understand why a Mac costs a bit more. Once they use a Mac they get it, which is why Cook's move to offer a few lower-priced options is so awesome. The only danger with this strategy is if the cheap Macs provide a sh tty OS X experience, which is why I'd like to see PCIe SSDs as the default drive on every Mac sold, with an option to add a HDD. Speed is more important than size if the intent is to hook a new Mac user. ...and we can all hold hands and sing Kumbaya.